A stellar all-round performance from Sunil Narine kept Dhaka Dynamites’ on title hunt of the much coveted Bangladesh Premier League (BPL) trophy as they overcame the first hurdle towards the final, thrashing Chittagong Vikings by 6 wickets in the eliminator at Sher-e-Bangla National Cricket Stadium on Monday. Narine snapped up 4 wickets for just 15 runs in a measly bowling effort which restricted Chittagong for just 135 runs losing 8 wickets after which the Caribbean stalwart gave the side an impetus with a 16 ball-31-run knock. Riding on his impressive start and complemented by Upul Tharanga’s well-composed 43-ball 51-run innings, Dhaka ran amok in Chittagong’s bowling line up to get over the target with 20 balls to spare. Dhaka will take on the loser between Rangpur Riders and Comilla Victorians on Wednesday in the second qualifier. 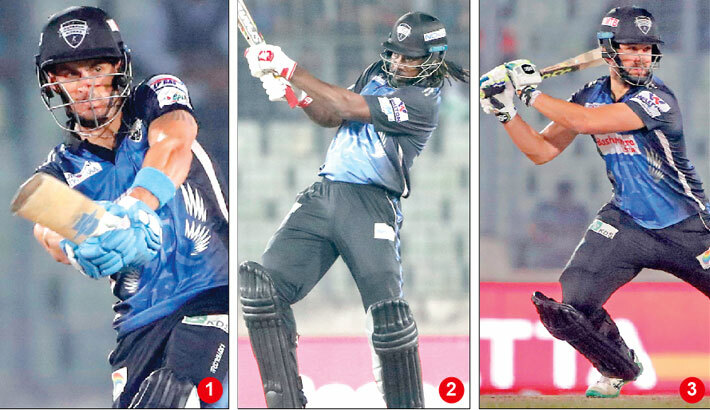 Before winning two matches in a row including eliminator, Dhaka lost five matches out of six. Dhaka skipper Shakib Al Hasan believed that those two latest victories would shift the momentum towards them. “We have won back to back matches so the momentum is with us and whoever loses the first qualifier will come losing their momentum,” said Shakib with confidence as he spoke about their chances to move into the final of BPL. Chittagong’s decision to bat first in the crucial game seemed to have paid a rich dividend when their top order kept the side in good stead despite an early dismissal of opener Yasir Ali (8). Cameron Delport and Shadman Islam serenely drove the side in a position of dominance until a smart fielding move by Quazi Anik caused Delport’s run-out. Delport by then made 36 runs off 27 balls with 5 fours and a six. Despite the dismissal of Delport, Chittagong was in good position but it was Narine whose impressive spell then tilted the momentum towards Dhaka. He first broke through with the wicket of Mushfiqur Rahim (8) with a tossed up delivery and it proved to be fatal for Chittagong considering the fact that he was the best batsman of their side. Narine then pushed Chittagong to a troublesome situation getting Shadman Islam who was brimming with confidence despite the dismissal of Mushfiqur Rahim. Shadman struck 2 fours and a six in his 24 runs off 19 balls. Those two wickets effectively pegged back Chittagong innings, leaving them at 86 runs for 4 wickets at the twelfth over. However, Narine not only took those wickets in a crucial moment but also stemmed the run flow, much to the disappointment of the Chittagong fans. Mosaddek Hossain continued his lone effort but Dhaka bowlers didn’t let loose the baton, striking at regular intervals with Narine at the fore. Mosaddek was dismissed in the penultimate delivery after scoring team’s highest 40 runs off 35 balls, clobbering 3 fours and a six. The target was easier and it became much easier when Narine gave the side a whirlwind start. Narine made a mockery of Chittagong bowlers right from the word go as Dhaka made 44 runs in just 4.1 overs before pacer Khaled Ahmed got the better of him in his first over. Of those 44 runs, Narine himself blasted 31 runs off 16 balls with 6 fours and a six. His fellow opener Upul Tharanga by then got himself settled in the wicket and shared further 44 runs with Rony Talukdar to make the game a single-sided affair. Pacer Khaled was impressive and dealt a double blow, dismissing Rony (20) and Shakib Al Hasan for naught in consecutive deliveries. But it hardly mattered as Dhaka by then were in safe position. Nayeem Hasan removed Tharaga after he reached fifty and scored 51 runs off 43 balls, sending the ball across the rope for 7 times. But victory was just a yard away for Dhaka. Nurul Hasan Sohan and Keiron Pollard sealed the deal patiently with Sohan unbeaten on 20 runs and Pollard on 7 runs. “A very good team effort, everyone was up to the challenge, knew how big of a game this was. To face any of the teams playing qualifier one will be a tough ask, but we have the momentum and that’s a positive sign. We always did well in Dhaka, the crowd has been supporting us throughout the season. We needed to give something back to them,” said Dynamites skipper Shakib Al Hasan on Monday. Man of the match Sunil Narine said that they are happy to win back to back matches that helped them remain alive in the tournament. “We needed back-to-back wins and the last game gave us some momentum. We are playing well and should win games if we play in the same manner. The wicket assisted a bit, kept it as simple as possible. It was a complete team effort. We went from strength to strength and finished off well. Credit goes to the entire team,” said Narine.